Happy New Year’s Eve! We started a tradition in 2012 when we posted our Favorite Moments in a “Best of” blog post. Well, it’s New Years Eve again, so it’s time to take a look back on 2016. This year was incredible: we celebrated 13 years together, traveled from LA to Houston to New York, released six documentary films following artists, hosted our first artist-in-residence, and continued production on our debut feature film following the late artist Chuck Ramirez. Here are our 10 favorite projects from 2016 (in order of release date), enjoy! Working primarily from objects found in Houston, Thorsten Brinkmann turned Rice Gallery into a place where the familiar is made strange as castaway goods are reimagined through Brinkmann’s idiosyncratic sensibility that combines assemblage sculptures with self-portrait and still life photography. Our film was selected as our 11th Vimeo Staff Pick and was featured on the National Geographic Short Film Showcase. Watch the film. As a tribute to his family, hometown, and father’s photography, artist Gary Sweeney covered the exterior of his childhood home with over one hundred large-scale family photographs. We traveled to Manhattan Beach, California to document the site-specific installation utilizing Gary’s childhood home, which had been in his family for 70 years. Watch the film. The Hudson River Museum hosted Jimmy Kuehnle’s first large-scale solo exhibition in New York. Kuehnle designed new inflatable works that engaged the museum’s architecture and performed in his inflatable suits during the Museum’s Kite Festival. We had the pleasure of following Jimmy’s performances seven years ago and were so fortunate to have the opportunity to catch up with his latest inflatable art. Watch the film. Crosstown Traffic, an installation by Michael De Feo, featured works visible through the glass wall while Rice Gallery was closed for the summer. Known as “The Flower Guy,” De Feo is a painter with a penchant for street art, gaining international recognition for painting over outdoor fashion ads with buoyant floral patterns. Watch the film. We founded a skateboarding crew with a group of friends in early September. Used initially as an outlet for Angela’s life goal of learning how to skateboard, the crew quickly began collaborating on photo shoots, video projects, and overall tomfoolery. When we get together, it’s a bad idea. Follow our adventures on Instagram. ChildSafe is a Children’s Advocacy Center — the only one in Bexar County — that provides specialized services to children and teenagers who have been abused, neglected, or sexually abused. ChildSafe is embarking on a bold new journey to build a state of the art facility that will be a national model for the treatment and care of abused children. We produced a short video highlighting the construction of the Salado Creek Campus. Watch the video. In October we welcomed artist Remy Bordas into our home studio as our first artist-in-residence. He spent his month here developing and creating new work for his portfolio. We assisted in the production of Remy’s performance and installation pieces through photo and video documentation. We love following artists in their studios, but having Remy work under our roof was really incredible. We plan to exhibit Remy’s work at a gallery in 2017. Follow #WalleyResidency to learn more! New York artist Jonathan Schipper is known for his time-based, kinetic installations that reveal the flow of time as imperceptible until, as in life, we see the physical evidence of its passing. Since Schipper’s installation changes over time, we will be producing an updated version of this documentary to include the final result. Until then, watch this film to learn more about Jonathan’s process and how Cubicle was made. Watch the film. The Albatross was an installation and performance piece by Margaret Craig at the Carver Community Cultural Center during Luminiaria 2016. We had a glimpse into Margaret’s art making practice four years ago in our short documentary Malleable Objects and were excited to follow her dynamic performance work. Watch the film. We have been in production on our debut feature documentary following the late artist Chuck Ramirez throughout the year. To keep our sponsors updated we have posted five updates this year detailing our progress and revealing some behind the scenes. We will continue to post blog updates until the film’s completion in 2017. The McNay Art Museum will exhibit the first significant survey of Chuck’s work in the upcoming exhibition Chuck Ramirez: All This and Heaven Too organized by the McNay’s Chief Curator/Curator of Contemporary Art René Paul Barilleaux and scheduled to run September 14, 2017 to January 14, 2018. The McNay has invited us and we have committed to screening the completed documentary film during the run of this exhibition. 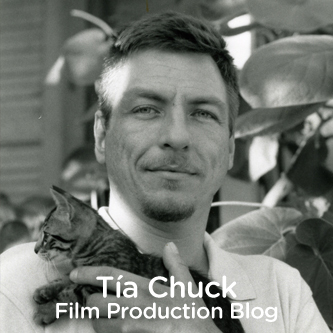 Visit TiaChuck.com to learn more about this upcoming film. It’s New Year’s Eve, so we’re taking some time to look back at our Top Five Favorite Moments of 2014. We want to thank our family, friends, and fans for supporting our work. From January through December, here are our top five favorite moments from 2014, enjoy! We produced this short parody promotional video as part of our art exhibition Creation to Consumption curated by Hills Snyder for the artist-run exhibition space, Sala Diaz. 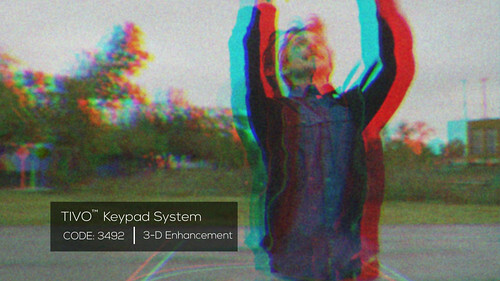 The film demonstrates the WALLEY POS-86, an impossible video camera that represents a reverse trend in consumer electronics. Since we released the film it has received over 323K views with features on Vimeo Staff Picks, Gizmodo, No Film School, PetaPixel, Fstoppers, designboom, and Laughing Squid. Watch the film. In April we documented the exhibition Crossing the Farther Shore by acclaimed Vietnamese American artist Dinh Q. Lê at Rice University Art Gallery. Le presented thousands of photographs of Southern Vietnam taken before and during the Vietnam War. The hand-stitched structures allude to the mosquito nets under which people sleep in Vietnam, creating what Lê calls a “sleeping, dreaming memory of Vietnam.” Watch the film. From artist Jennifer Ling Datchuk:”‘He loves me, he loves me not’ was a game I played as a little girl. I would pluck flowers bare of its beautiful petals in hopes the last one spoken determined my hearts desired intentions. As an adult, I have allowed not only men to define my identity but that of my mixed race ethnicity and navigating the world as an ‘other’. In this performance piece, I pluck my eyebrows bare until my identity becomes almost erased. On view as part of the exhibition Dark and Lovely September 4, 2014 – November 9, 2014 at Blue Star Contemporary Art Center.” Watch the film. Learn more about Jennifer’s work at www.JenniferLingDatchuk.com. Our documentary film following the life and work of artist Chuck Ramirez was successfully funded in October. It meant so much to us to have the support of the community for this film. We are currently in production and have plans to release the film in 2015. Visit www.TiaChuck.com for updates. Portrait of Chuck courtesy of Warren Borror. Rueben Singleterry, the 14-year-old son of Angela’s cousin Roxanne. The first week of his freshman year, Rueben was diagnosed with a rare illness that almost took his life. He spent the last few months beating the odds to an almost full recovery. Rueben wanted us to document his story so he can help inspire others to never give up, no matter how difficult the circumstances. Part of Rueben’s desire to recover was so he could pursue his passion for playing basketball. We’ll be following Rueben’s journey and look forward to sharing his story with you. 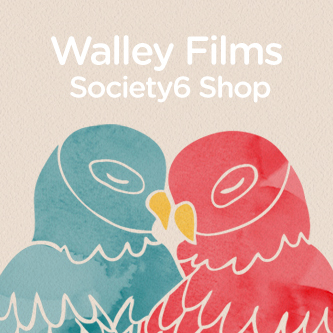 Visit www.WalleyFilms.com/Rueben-Singleterry for updates. Happy New Year to you, we look forward to continuing our film work in 2015! We started working on a new short documentary film project with Rice University Art Gallery this month. Rice Gallery invited Baltimore-based street artist Gaia to create a new installation in their space and we’ve been documenting his progress. Gaia has been so much fun to work with. Not only has he given us his time during filming, but we also had the chance to work on some silly stop motion animations. Here are a couple we made during visit to Houston last week. Enjoy!